Neurofeedback training (NFT) is a procedure that tries to shape a participant's pattern of brain activity by providing real-time feedback, often in the form of a video game combined with other sensory stimuli that provide rewards when the “correct” state is achieved. The most common form of NFT uses EEG (brainwave) activity recorded non-invasively from the scalp. The EEG is a complex mixture of neural oscillations of different frequencies. Specific frequency bands are targeted for enhancement or reduction, so the participant can learn to modulate their own brain activity. An overview of the neurofeedback process is shown below. Signals are recorded from sensors, processed, and classified. The calculated signal is then presented to the subject via feedback in one or more sensory modalities. Participants can learn to modulate their neural function, and complete the loop when the feedback is processed. modified from Fig 1 (Sitaram et al., 2016). The methods included here are electroencephalography (EEG), magnetoencephalography (MEG) and invasive electrocorticography (ECoG). MVPA, multivariate patterns of activity. FFT, fast Fourier transformation. For online training, the EEG signal was ... band-pass filtered to extract alpha (8–12 Hz) amplitude with an epoch size of 0.5 s. Here, subjects were rewarded upon reduction of their absolute alpha amplitude... Visual feedback was clearly displayed on a monitor via 1) a dynamic bar graph at the center of the screen whose height was proportional to real-time alpha fluctuations and 2) a “Space Race” game, where a spaceship advanced through space when amplitude was below threshold, and became stationary when above threshold. No explicit instructions were given on how to achieve control over the spaceship, and all participants were told to be guided by the visual feedback process. In a sham condition, the participants were shown feedback recorded from another subject in an earlier session (Ros et al., 2016). Having a sham (or placebo) condition is critical for demonstrating that any gains in performance (or increases in long-range temporal correlations, in this example) are due to self-regulation of specific EEG features learned during training, and not from some generic aspect of the procedure. In academic articles, neurofeedback is often called closed-loop brain training, perhaps to distinguish it from neurofeedback therapy (also NFT). A recent paper in Nature Reviews Neuroscience discussed experimental applications of NFT1 and theories of the underlying mechanisms. Animal studies have demonstrated that rats and monkeys are capable of modulating the firing rates of small groups of neurons. Models of neurofeedback learning include instrumental (operant) conditioning, motor learning, global workspace theory, and skill learning. Exciting and important research ventures that capitalize on NFT are applications to brain-computer interfaces (BCI) and brain-machine interfaces (BMI), which have allowed paralyzed individuals to type and move prosthetic hands. Psychiatric applications of NFT have been more problematic. First, you have to correctly identify the frequency band(s) that are abnormal in a clinical population. Then you must have a principled method for selecting the NFT protocol. Finally, you must demonstrate that your specific NFT protocol is superior to sham feedback (in a randomized, controlled trial). Unfortunately, this is rarely done. Neurofeedback therapy has received critical coverage from the press in recent weeks. The new U.S. Secretary of Education, billionaire Betsy DeVos, has a major financial stake in an NFT company called Neurocore. The New York Times ran two articles critical of both DeVoss's conflict of interest and of the supposed benefits of NFT. And Neurocore is in no way unique. Hundreds of Neurofeedback Centers offer cures for everything from A to T by merely wearing a few electrodes and playing a computer game for 20-30 sessions (and $2,000-3,000). Advocates of neurofeedback make bold claims concerning brain regulation, treatment of disorders, and mental health. Decades of research and thousands of peer-reviewed publications support neurofeedback using electroencephalography (EEG-nf); yet, few experiments isolate the act of receiving feedback from a specific brain signal as a necessary precursor to obtain the purported benefits. Moreover, while psychosocial parameters including participant motivation and expectation, rather than neurobiological substrates, seem to fuel clinical improvement across a wide range of disorders, for-profit clinics continue to sprout across North America and Europe. Neurofeedback. Natural treatment for sleep disorders & insomnia. Neurocore’s approach to treating insomnia and sleeping disorders starts by looking at the brain. Using advanced qEEG technology, we measure your brainwaves to help identify the cause of the problem. We also monitor your heart rate and evaluate how in sync it is with your breathing pattern. Your unique neurometrics yield a customized neurofeedback training program that will teach your brain to self-regulate. The result is a brain that’s calibrated for better ongoing recovery, which means better sleep for you. But the Neurocore “neurometrics” are not obtained from a clinical sleep study (polysomnography) which measures not only brain and heart activity, but also muscle activity, eye movements, and respiration. They haven't identified the “cause of the problem”. It could be sleep apnea or another medical condition. Importantly, during the NFT condition, participants had to enhance EEG amplitudes in the SMR range between 12 and 15 Hz, whereas during the PFT sessions participants had to enhance random frequency ranges between 7 and 20 Hz (but not the 12–15 Hz SMR range); importantly within a PFT session only one frequency was trained and rewarded. The reason for choosing this kind of placebo or sham protocol was to involve patients to a similar degree as in NFT, yet with no specific frequency being rewarded systematically. Rewarding another frequency systematically could have resulted in undesired effects on EEG and behaviour that would render the PFT control condition suboptimal. Outcome variables were objective (EEG) and subjective measures of sleep quality. A forthcoming commentary from Thibault et al. (2017) summarizes the results in a nifty cartoon. As expected, when participants received genuine neurofeedback, they were able to significantly increase power in the SMR frequency band. This was not the case during sham neurofeedback sessions. Genuine neurofeedback did not alter objective measures of sleep quality (nor did sham). The most important result came in the patient ratings of subjective sleep quality. 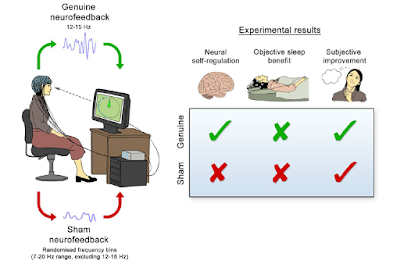 Genuine SMR neurofeedback improved subjective sleep measures, BUT SO DID SHAM NEUROFEEDBACK. This suggests that any benefit obtained from NFT was due to a placebo effect. Although this was a small study with some complications (e.g., nine of the 25 patients were “misperception” insomniacs with no objective indicators of insomnia), the results were informative about the cause of subjective improvements — they were non-specific in nature and did not rely on training SMR activity. Whether real or sham, neurofeedback demands high engagement and immerses patients in a seemingly cutting-edge technological environment over many recurring sessions. ... In this regard, neurofeedback may represent an especially powerful form of placebo intervention—a kind of superplacebo. Amusingly, they define superplacebo as “A treatment that is actually a placebo although neither the prescribing practitioner nor the receiving patient is aware of the absence of evidence to recommend it therapeutically.” If everyone thinks neurofeedback treatment works, it is more likely to do so, even though it bears no relation to self-regulation of selective neural activity. Future studies with refined NFT protocols may yet “tune” the brain in a desired direction, but for now... buyer beware. 1 The paper also reviewed neurofeedback studies that use hemodynamic measures. NFT based on fMRI is a newer (and more expensive) development that won't be covered here. The question that begs to be asked is, "who's payroll is this Neurocritic's guy on? Sofi Aventis, the makers of Ambien? Belsorma? The on-line therapy for insomnia lobby? He did massive research on how seemingly non-effective neurofeedback is for insomnia, but didn't bother to read the fine print on outfits like Shuti.me. In their "landmark" study, after 6 to 9 weeks of (basically off-the-shelf tips and tricks easily found on google...for free),the best result was only an extra 30 minute of additional sleep per night. And the other study sited to compare neurofeedback to placebo? It wasn't even placebo! They just used another neurofeedback protocol that wasn't even close to being scientific based sham, or a double blind control. Jeez, if a normal Joe Blow like me can figure this out, why couldn't you? This a an obvious attack on Betsy Devos, her NeuroCore outfit, which uses 45 year old neurofeedback technology as its treatment protocol. The field of neurofeedback has moved so far beyond that, but hey, that doesn't seem to be juicy enough FAKE NEWS for the guy to be bothered to do present day research on. Somebody is greasing this guys palm. Do your own research and look beyond the propaganda nonsense like this, trying to keep people on Ambien forever. I challenge Neurocritic to leave this comment up to prove his journalist integrity. Believe me, I'm not holding my breath. Here you go, Anonymous. No need to hold your breath. First, I must commend you for writing this article. But what had much significance to me here is how the power of expecation works psychologically about sleep therapy.. reconsider the phrase "If everyone thinks neurofeedback treatment works, it is more likely to do so, even though it bears no relation to self-regulation of selective neural activity." How did Gall Identify his 27 Faculties?